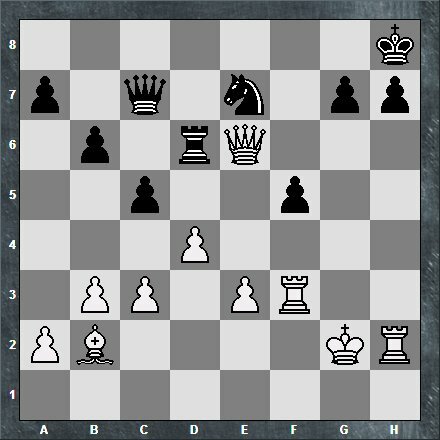 This week's game comes from Round 2 of the Colorado Springs Chess Club's August Swiss 90 (4SS, G/90+30) and Round 6 of this year's match-ups with Brian Rountree. We have faced-off in February (regular), April (quick), twice in May (regular), July (quick), and now in August (regular). He is my most common opponent in the past year (+8-1=0). It is getting harder to beat him consistently. I have to throw everything I have at him plus the kitchen sink. Fortunately, I have found that throwing my Rook at him works the best. In the past three games with Brian, I have used a Rook Sacrifice to win the game. Sometimes it is a good move. During the second May match-up, I found myself in this position. I played 28.Rxh7+ Kxh7 29.Rh3# for a nice finish. However, sometimes it is a bad move. During the July matchup, we were playing with a quick time-control, and I didn't have enough time to work out my second attempt to sacrifice my Rook in two games against Brian. I figured I had to go for it but missed the Only-Move that refuted my choice. Fortunately, Brian missed it too, and I was 2-for-2 on my Rook Sacrifices versus Brian. My third chance to sacrifice my Rook came in our third straight meeting. This time I had the knowledge that I had been right one time and wrong the other time. The time I was wrong was a quick game, and I had the safety net of time pressure. This time we were back to turtle mode, and Brian is the Master Turtle. Bxc3 6. dxc3 d6 7. Nf3 O-O 8. O-O Qe7 9. Qc2 Be6 10. b3 h6 11. Bb2 Nbd7 12. 32. Rb3 Qe6 33. Rb7 e4 34. Bg2 Nd5 35. Ba3 Rfe8 36. Bh3 Qxh3 37. Rxc6 e3 38. 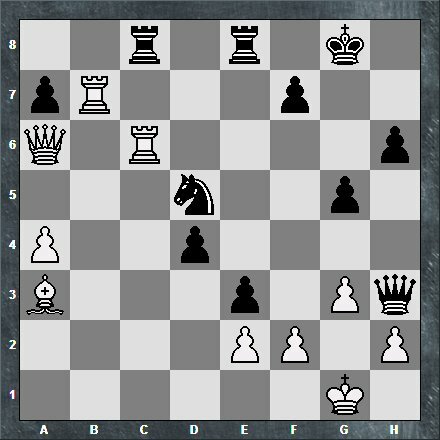 On August 14th, the Colorado Springs Chess Club continued the August Swiss 90 (4SS, G/90+30). On July 23, 2018, the Board of Directors for the Colorado State Chess Association (CSCA) voted to have a hearing to investigate if any violation of the CSCA Code of Conduct occurred by you while a member of the CSCA. The Board received complaints from members, chess clubs, tournament directors, and event organizers. You have the right to attend the hearing and to call witnesses on your behalf. Chess players and observers will treat each other, tournament directors, and event organizers with the utmost respect. Will not engage in any form of un-sportsmanlike conduct. Uncivil conduct to include any form of behavior disruptive to the chess playing environment. The written letter of complaint received by the Board can be provided upon request.